Sell your RHAPSODY (OF FIRE) items on eBay ! It's very obvious that very little people pay attention about this band as this new album has been released couple of months ago but no one has reviewed it. This proves that the band is much more suitable categorized under metal band instead of prog band. Well, whatever the reason, I still love the band especially this nwe album demonstrates their mastery of making great music, combining the speed nature of power metal and symphonic style with abundant orchestral arrangements throughout the album. I knew the band from my metal colleague who introduced me to "Dawn of Victory" that blew me away at first spin. It's probably because I love the combination of rock (or metal) music with orchestral arrangements especially when the melody runs beautifully across the album. With its tradition of opening an album using narration, this is the case with this album where the opening track is a great narration "Dark Frozen World" followed wonderfully with melodic power symphonic metal musc "Sea Of Fate". From these two tracks I can imagine what would happen with the other tracks that follow. In fact my prediction was right as the third one "Crystal Moonlight" runs similarly with the second track. It has fast bass guitar solo in the middle followed by beautiful guitar solo. "Reign Of Terror" opens in an ambient mode with pastoral organ work followed with riffs and power metal music in relatively fast tempo. There is part which has a very fast riff and vocal scream. Even though this is the kind of track that favor me, put it in the middle of the album, it provides excellent variation of the music. "Danza Di Fuoco E Ghiaccio" starts with a low register notes narration backed with acoustic guitar work followed with traditional music which runs beautifully and .. I like it very much! It's actually quite weird a power metal band sings this kind of tune but it enriches the album from the musical variety perspective. "Raging Starfire" brings back the music into a power metal style with fast speed riffs but the guitar solo is quite melodic and it makes the overall music is enjoyable. "Lost In Cold Dreams" is a wonderfully crafted ballad composed with acoustic guitar work as background. The strength of the song is at its memorable melody. Wether or not you like metal you must like this tune because the melody is really great! I bet you will replay this tune when you spin it. "On The Way To Ainor" brings the music back into speed and melody. "The Frozen Tears Of Angels" opens with narration as an album closing. This concluding track is composed like an epic with slow or mellow part followed with metal music and symphony. I enjoy the riffs as well as the overall composition. I have Bonus Tracks "Labyrinth Of Madness" and "Sea Of Fate (Orchestral Version)" that are both of them are excellent composition. Overall, this is another wonderfully crafted album released by Rhapsody of Fire. I believe this album would satisfy those who like the original work of the band in the past. It's a four-star PLUS rating. Keep on proggin' ! Pack your bags, we are off again! Having been left hanging on in quiet desperation for some four years, Rhapsody of Fire finally returned in 2010 to continue "The Dark secret saga", this being part 3. This particular story began in 2004 (when the band were simply known as Rhapsody) on the album "Symphony of Enchanted Lands II - The Dark Secret". It continued a couple of years later with "Triumph Or Agony", the first album released under the name Rhapsody of Fire. When we last heard of the quest of our heroes, they had found the black book written with the blood of angels which contains "The dark secret", an evil prophesy, and things seemed to be going rather well. Fortunately, this is not in fact the case, and the story must continue. The baddies here are the Disciples of the Black Order, who would very much like to get hold of the book and release Nekron's evil, which it contains. The antidote to all this turns out to be, wait for it, a white book(!) written by goodie Erian. Unfortunately, that book is not to hand, and hence another quest must be undertaken to get hold of it before the bad guys. Christopher Lee once again returns as narrator, the sleeve notes even containing a "costume credit" for him. He is joined by a number of other actors, including a return of the lovely Susannah York, who sadly died as I was writing this review in January 2011, playing Elion. While Lucca Turilli and Alex Staropoli dominate the song writing as usual, Fabio Lione also gets a credit this time. Musically, the time between the last release and this has been put to good use, the songs here being notably stronger than those on "Triumph or agony". Tracks such as "Reign of terror" take us back to the gloriously over the top choirs and orchestras of the good old days, while contrasting delightfully with the pixie folk of the following "Danza di fuoco e Ghiaccio". With lyrics alternating between English, Italian and possibly Latin, there is a naturally enforced diversity to the vocal styles too. While a couple of the tracks run to around 7 minutes, the feature track here is the 11 minute closing epic which bears the album's title. The closing words of the lyric sheet are "To be continued...", indicating that this saga is not yet complete. Indeed, the next full instalment is scheduled for release in Spring 2011. Once again, the album is presented with a superb booklet containing the story and the lyrics, the artwork being conceived by Turilli and Staropoli and realised by Felipe Machado Franco. The digipak version has two additional tracks. "Labyrinth of madness" opens with a wonderful guitar crescendo, this instrumental track being a vehicle for Luca Turilli to display his lead guitar dexterity. The other bonus track is an orchestral version of the song selected as a single from the album, "Sea of fate". This version is certainly different, being delivered as a majestic ballad. It is very easy with a band such as Rhapsody of Fire, to visit them superficially and then perceive them as a cheesy prog metal band. To do so is not only self defeating, it is disingenuous to the time and effort they put into crafting their product. The stories alone are works of art which may well at some stage be brought together as cohesive volumes. Admittedly not the stuff of Booker Prizes, but infinitely more readable and enjoyable. The music is composed and performed with great attention to detail, complex choral and orchestral arrangements being paired with supreme melodies and lyrics which complement the stories. The similarity of the albums is the band's strength, they offer a product of unwavering quality and pleasure. The Frozen Tears of Angels is an exciting return to form for Rhapsody after the slightly bland Triumph or Agony. The folky influences they had so far been neglecting in the Dark Secret albums make a welcome return, and they even dabble in some extreme metal sounds, with some honest to goodness shrieked vocals making an appearance. Luca's guitar work is the star of the show once again and the band as a whole invest substantially more passion into their music than was evident on Triumph or Agony. Clearly, the sobbing angels are in their heaven and all's right with Rhapsody again. 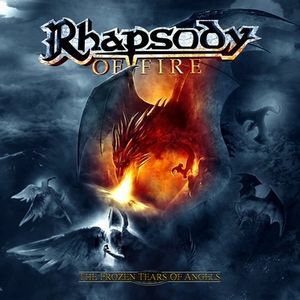 Post a review of RHAPSODY (OF FIRE) "Frozen Tears Of Angels"